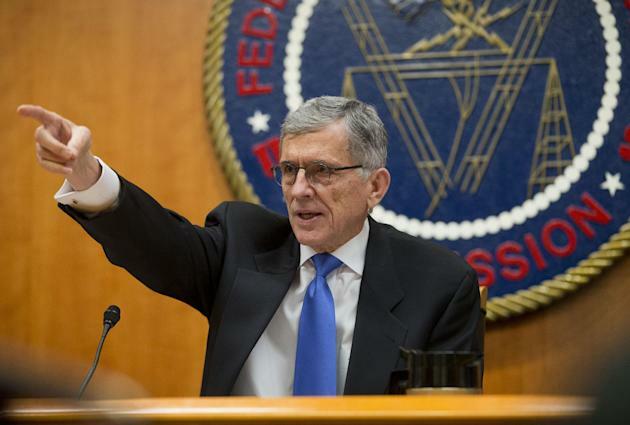 The Federal Communications Commission is set to vote Thursday on a new set of rules for Internet service providers. And while Democratic Chairman Tom Wheeler’s proposal to regulate the Internet like water, electricity and other public utilities is slated for approval, the months (years, actually) of fighting over net neutrality, both within the FCC and on Capitol Hill, won’t likely end there. As Thursday’s vote has drawn closer, Wheeler continued to face pressure from within his own party to amend the net neutrality rules. And contrary to a report in The New York Times on Tuesday suggesting that Republican lawmakers once poised to pounce on new FCC rules with counteracting legislation have now accepted defeat, Republican Senator and Senate Commerce Committee Chairman John Thune tweeted that the GOP has far from conceded on the hot topic. Claims that Republicans conceded on #NetNeutrality are a mischaracterization. I am committed to a legislative solution to @FCC power grab. Beyond the response on Capitol Hill, the FCC can almost certainly expect a legal challenge to the new rules from the Internet service providers it seeks to regulate. So for all those who’ve avoided the net neutrality conversation, it’s not too late. In fact, there’s no better time to start paying attention. Sure, net neutrality isn’t exactly riveting date or dinner party fodder. But while friends and neighbors might not be impressed with your ability to rattle off the arguments for and against federally regulated Internet service, the direct impact that Thursday's vote — and its inevitable fallout — could have on your life and, more important, your wallet make it worth familiarizing yourself with the issue. But fear not. Net neutrality, and the heated debate that’s surrounded it, aren’t nearly as bewildering as they seem. Seriously. Net neutrality revolves around a key question: Should internet bandwidth be treated equally for everyone? Here's a look at the debate. Before even attempting to tackle the politics of Thursday’s vote, we need to get one thing straight: What is net neutrality? The elusive term, coined by Columbia Law School Professor Tim Wu in 2003, refers to the concept of an open Internet, wherein all data — from music-sharing sites to social networks to personal blogs — exists on a level playing field, free from discrimination. Discrimination, in this sense, means the ability of Internet service providers (or ISPs), like Comcast, Verizon or AT&T, to act as Internet gatekeepers — controlling not only which websites, apps or other content is available online, but the speed at which that content may be accessed. In other words, if an ISP like Comcast charged a premium for faster service, it would give the Internet’s big money makers a major leg up over smaller, less profitable sites. Not only would users be forced to choose between waiting a painfully long time to download a song for free on SoundCloud and paying to listen instantly on iTunes, ISP fees might push sites like YouTube to start charging for things we’ve long grown accustomed to receiving for nothing. Beyond that, there is the chance that service providers would give preferential treatment to the companies with which they collaborate. For example, Verizon could make it so the websites of smartphone companies that use Verizon’s mobile service work faster than the websites of other smartphone companies. Ultimately, the Internet has the potential to become exclusive, limited and very costly, which, net neutrality advocates argue, would violate what many see as a human right to Internet access. How did this become a political debate? Without going too far back in history, we can trace the current debate to a federal appeals court ruling from January 2014. Siding with Verizon in a suit against the FCC, the U.S. Court of Appeals for the District of Columbia struck down a set of net neutrality rules the FCC had adopted in 2010. More than a decade earlier, before the Internet evolved into its current form, the FCC had specifically chosen not to classify broadband Internet as a classic telecommunications service. Therefore, the court ruled, broadband providers were not subject to the same “common carrier” rules that telephone companies, for example, must adhere to. In response to this ruling, last November President Obama called on the FCC to enforce net neutrality with the “strongest possible rules,” urging the commission to reclassify Internet service providers under Title II of the 1934 Communications Act in order to regulate the Internet like a public utility. Obama’s call to action was met with challenges from Republican lawmakers like Sen. Ted Cruz, who charged that net neutrality actually threatens the freedom of the Internet and would hinder the growth of the tech industry. Yet FCC Chairman Tom Wheeler’s announcement earlier this month that he planned to propose the “strongest open Internet protections ever proposed by the FCC” was seen by Republicans as direct evidence of the president’s influence over the commission. “It’s a power grab for the federal government by the chairman of a supposedly independent agency who finally succumbed to the bully tactics of political activists and the president himself,” Thune said of Wheeler’s announcement, arguing that what might have worked to combat telecommunication monopolies in the 1930s has no place in today’s high-tech economy. “Regulating the Internet through ill-suited and antiquated authorities that were designed for the monopoly phone era will ultimately make the Internet more rigid and less innovative,” Thune said. Senate Republicans ultimately tabled an earlier plan to put out legislation ahead of the FCC vote. But Thune’s recent tweet suggests he still has every intention to try to override Wheeler’s rules in Congress. And while the FCC has received overwhelming support from Internet companies like Google, Netflix and Etsy, Internet service provider giants like AT&T have already promised to sue the FCC if Wheeler’s rules are approved. The FCC’s last attempt to impose rules on ISPs may have ended in a lawsuit, but Wheeler told the tech site CNET in an interview last month that he's confident his new rules can stand up to the challenge.